The 1:18 Lamborghini Huracan LP610-4 is the most awaited model for the year 2014 from Bburago’s staple… Announced a while back in their site and the first few models are shown off along side the launch of the real Lamborghini Huracan LP610-4 in 2014 Geneva Auto Show. 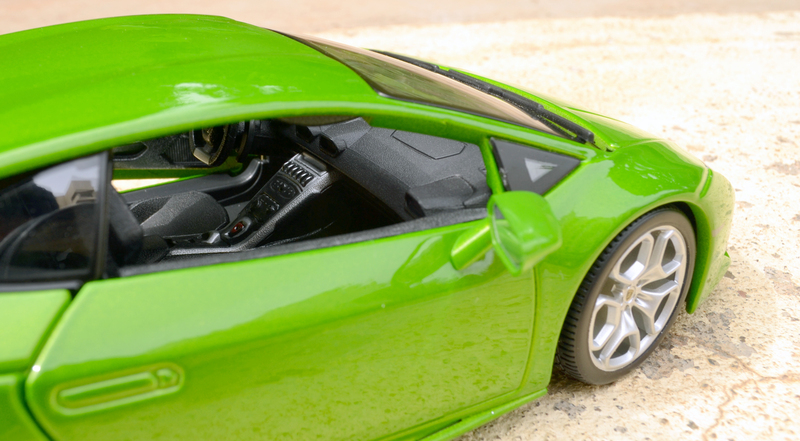 These diecast models were such a massive hit at the show the green one sold out the first day while the Giallo and Bianco lasted a little longer. 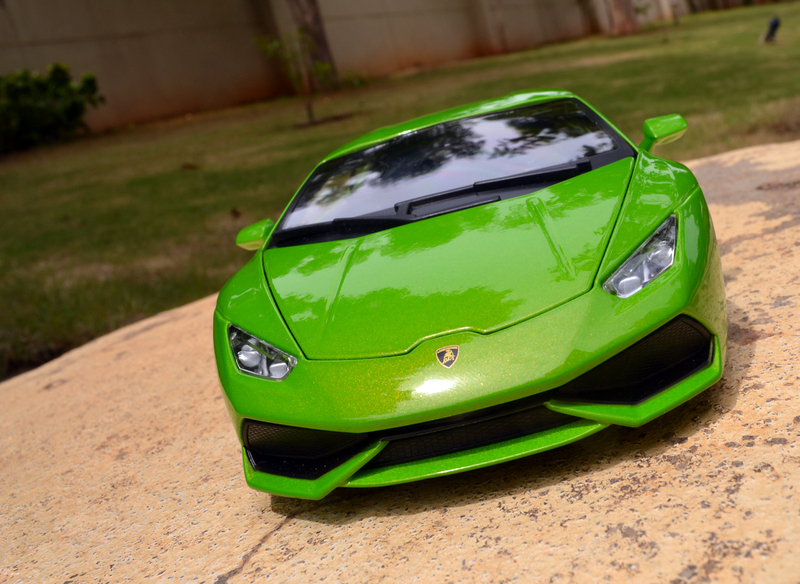 I have to wait a little bit more to set my hands on this Italian Bull or the Spanish Hurricane! 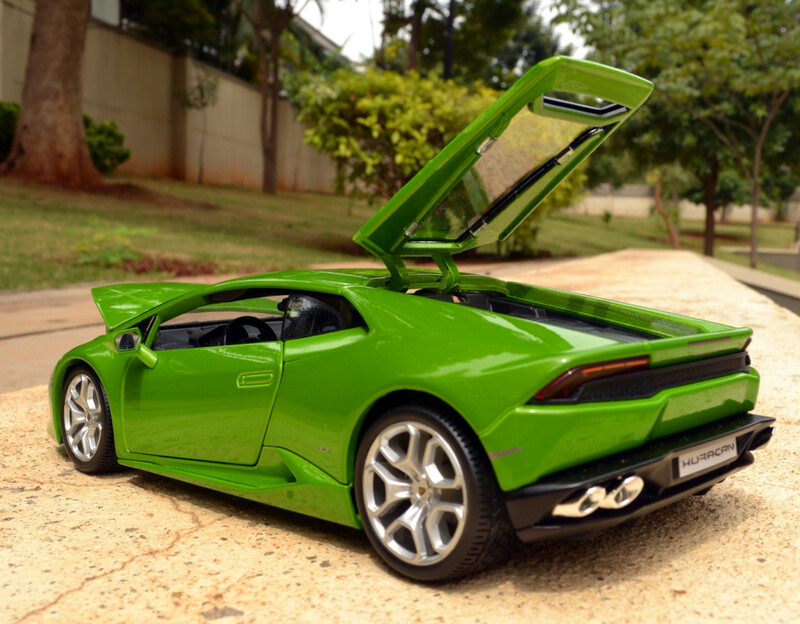 History: The Lamborghini Huracan LP610-4 is named after a Spanish Fighting Bull similar to various other Lamborghini car models. Huracan also means the Spanish word for hurricane, which makes more sense as this Lamborghini can do some serious speeds. 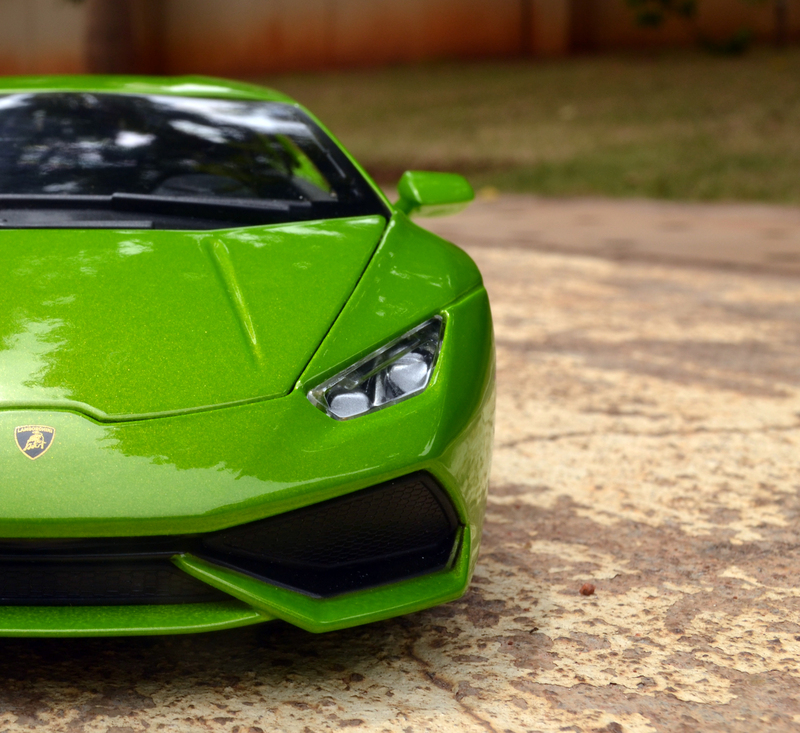 The Huracan replaces Lamborghini’s sales leader and most produced Gallardo. 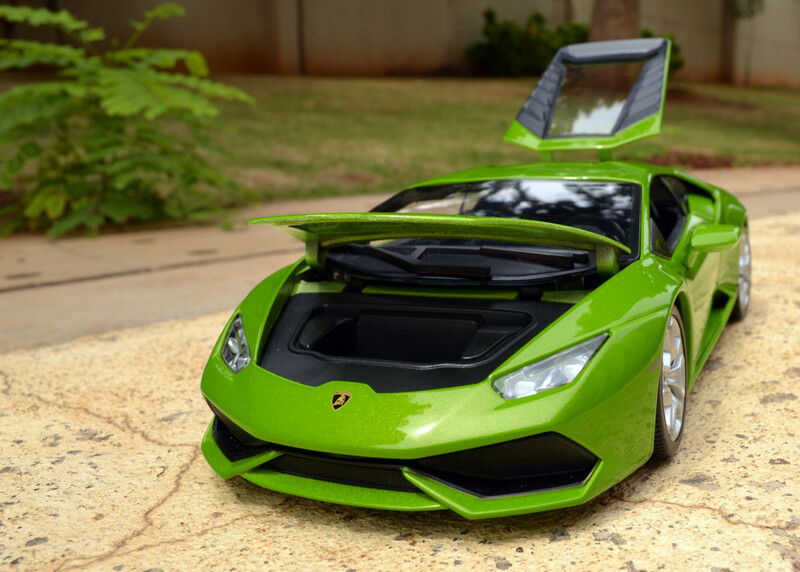 Powered by the same 5.2 L naturally aspirated V10 engine from the Gallardo but tuned to chun out 610PS. 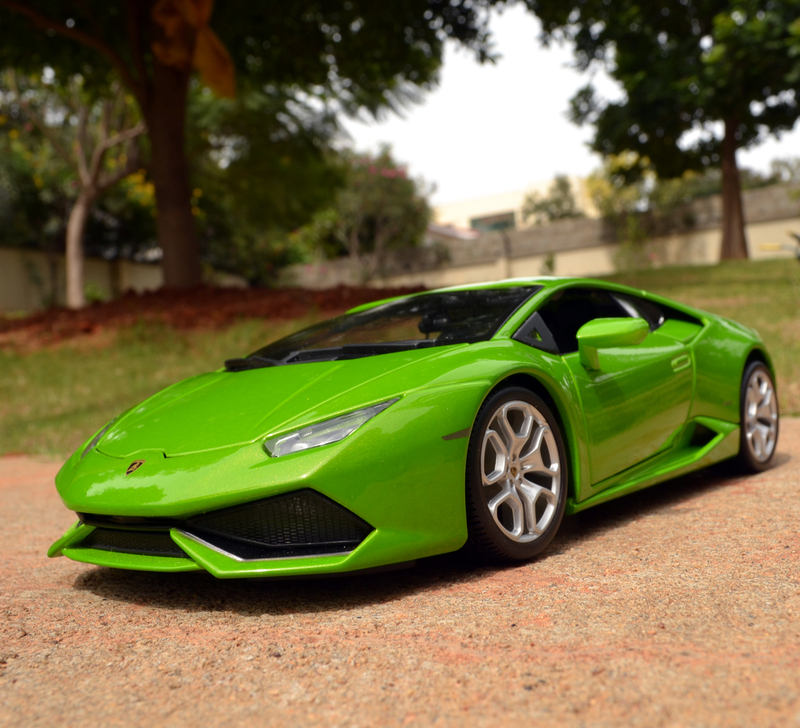 The power is transfered to all wheels via a 7-speed dual clutch transmission… This Lamborghini Huracan LP610-4 can reach a top speed of over 325kmh (202 mph) and also it can reach there real quick as it weigh only 1,422kg. 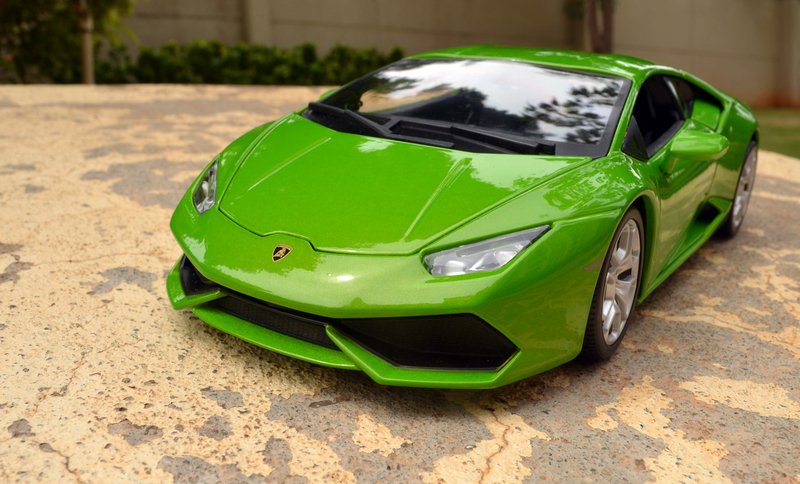 Overview: The Green (Verde Mantis as per Lamborghini) is kind of the popular model both in 1:18 and well as in real world, so hunting it down was not a easy task (read about all this Green Huracan hunt and unboxing here)… Bburago model are known for it authentic details and weight, this model hold true to its name! 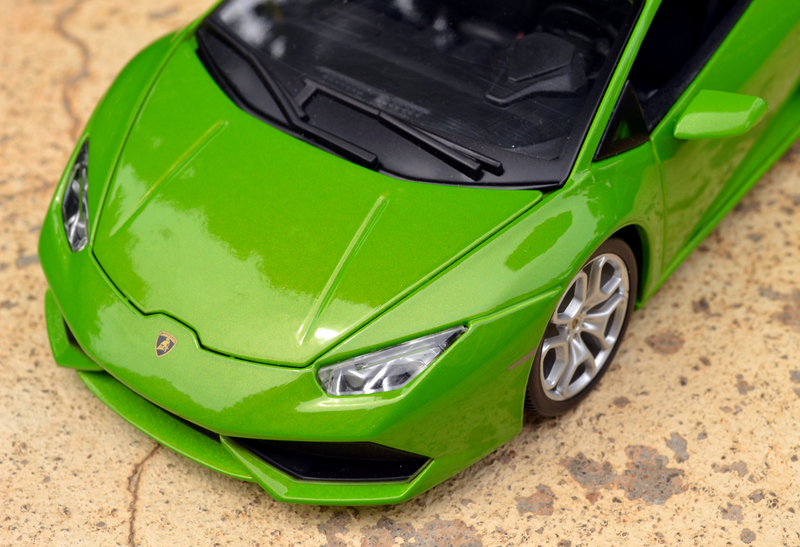 The scaling seems accurate, the color matches perfectly with the real shade of Verde Mantis and even the decals are not dodgy as other Bburago like the the Aventador etc. 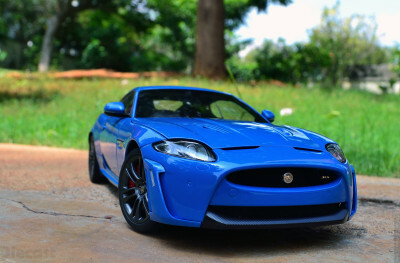 Paint Finish & Headlamps: The first and the far most exterior details that grabs you is the paint finish!! 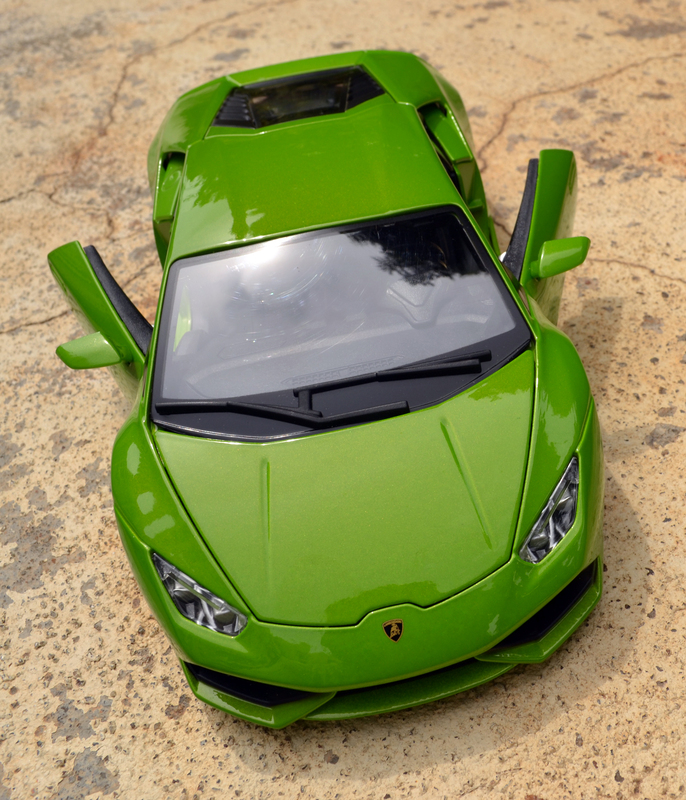 I fell in love with this Green Color Huracan LP610-4 immediately after first glance on a youtube video though I was not so sure how this would look in this scale… but still I ordered for it as this is by far the best color for this Lamborghini. 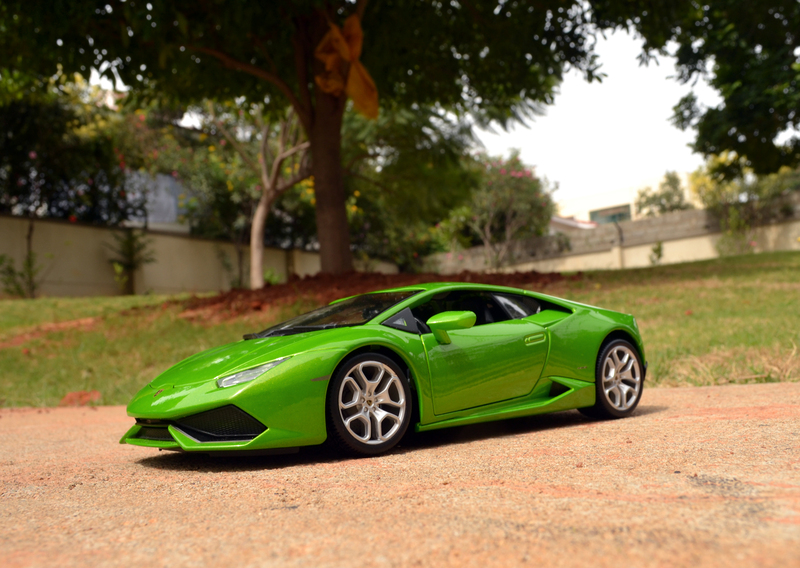 When I was doing a photoshoot with other two Lamborghini (Aventador in Orange and Gallardo in White) this very Lamborghini Huracan stood out purely for its color and finish. 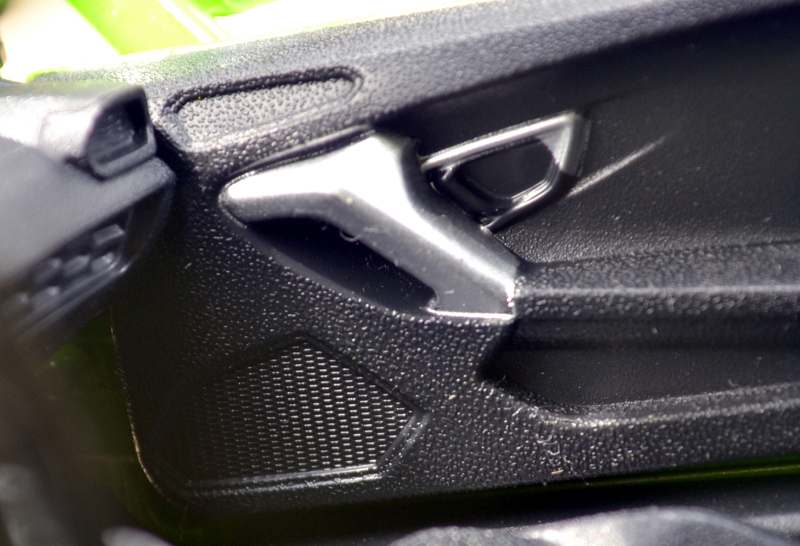 The next very detail that anybody would look for is its all LED headlamp console…which I kind of disappointed as the details are not upto the mark and this is the greatest bummer! 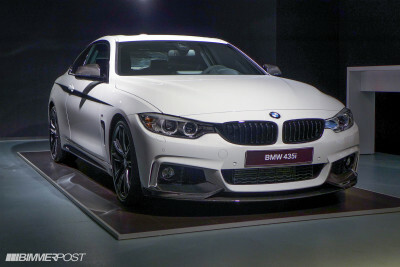 Scaling & Wheels: The profile view show nothing but striking aggression!! The scaling of this Lamborghini kind of seems missed here, not by a very large margin but by few notches! 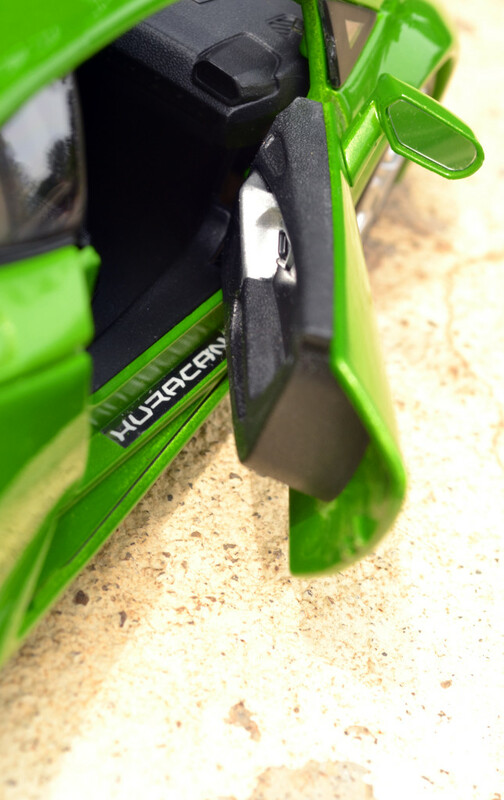 This view makes this Hyracan look a little tall and the clearance also suffers bad! The wheel pattern on first though seem to have come from Mercedes Benz A-Class AMG but on a closer look and of cource after some R&D found out that this very alloy pattern is called Giano Casted Rims 20 inch are the one that Huracan LP610 gets as standard fitment. 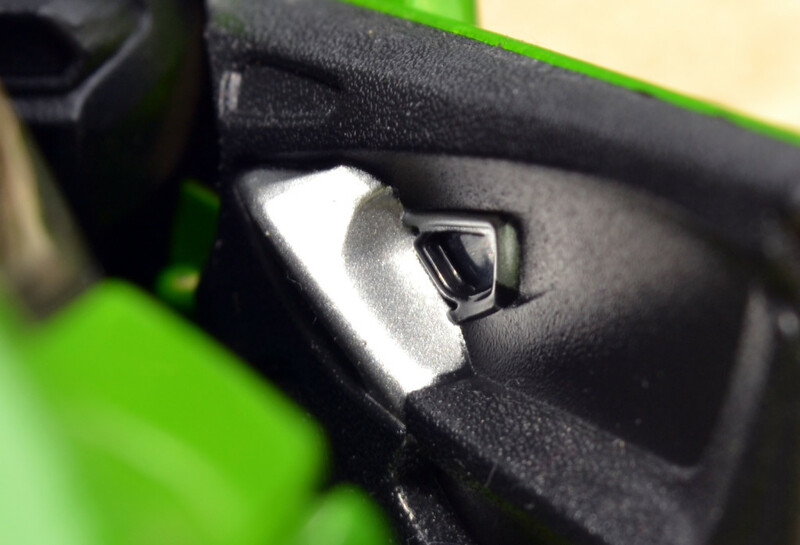 Hood: The hood on the other hand opens up wide but because of the tight shut lines opening it up for the first few times may be a tough!! 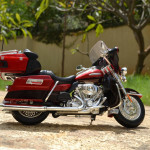 Be very very careful or else you would end up scraping its paint. I had trouble first couple of attempts so I used a very sharp exoto knife to pop the hood, from there on all I have to do is flip the model upside down then we are on. Under the hood lies no surprises!! 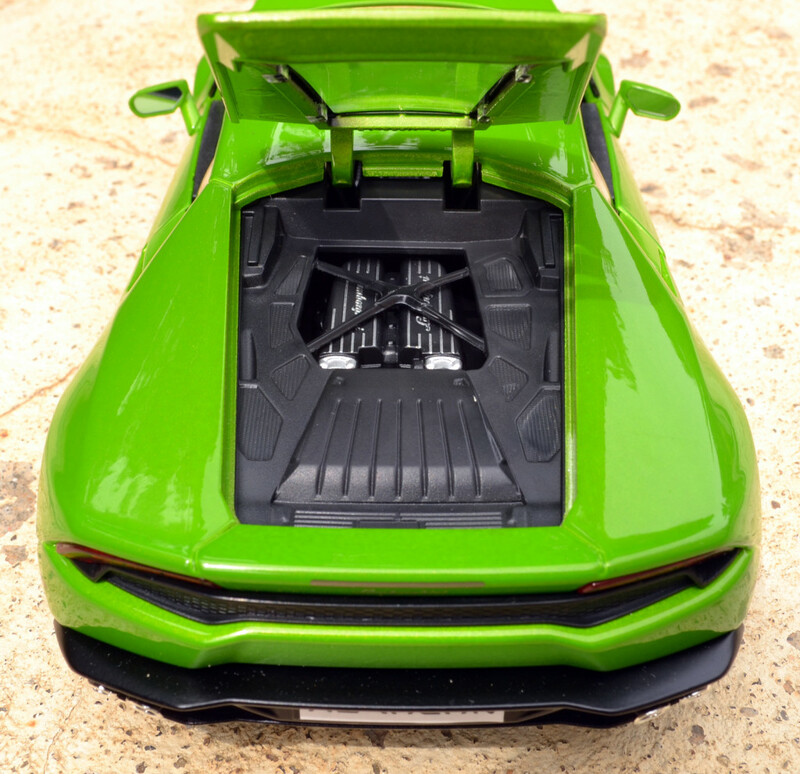 Doors: This Huracan model comes with opening doors features like in most other diecast model… Though the doors open but they harly open and that too a very small angle… Check out the door in open position… It is so narrow even the door with HURACAN badging is not fully visible! I tried droping a figurine in that gap and failed big time! The interesting thigh about this opening doors is the spring(very strong) loaded locking system!! 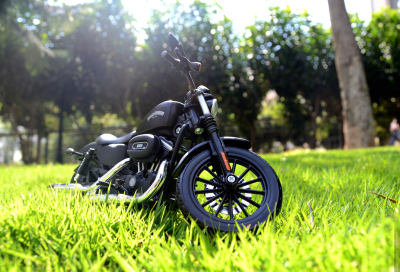 So if you are planing to display this diecast model with its doors open or planing to do some sort of diorama, wait for some other diecast maker to make it. Interiors: The interiors look and feel plasticky but the texture in the seats and the dash console are nice if viewed from a distance! 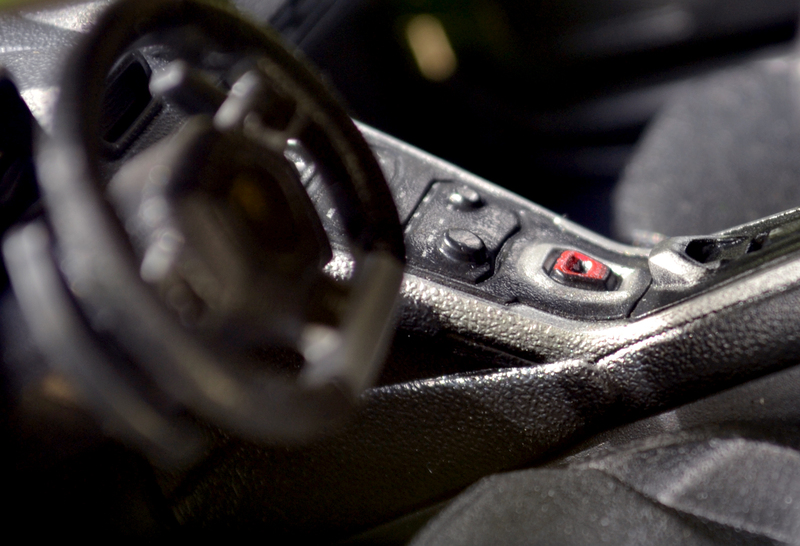 The steering wheel is of proper proportion and the mounted controls are nice so as the dash readouts! 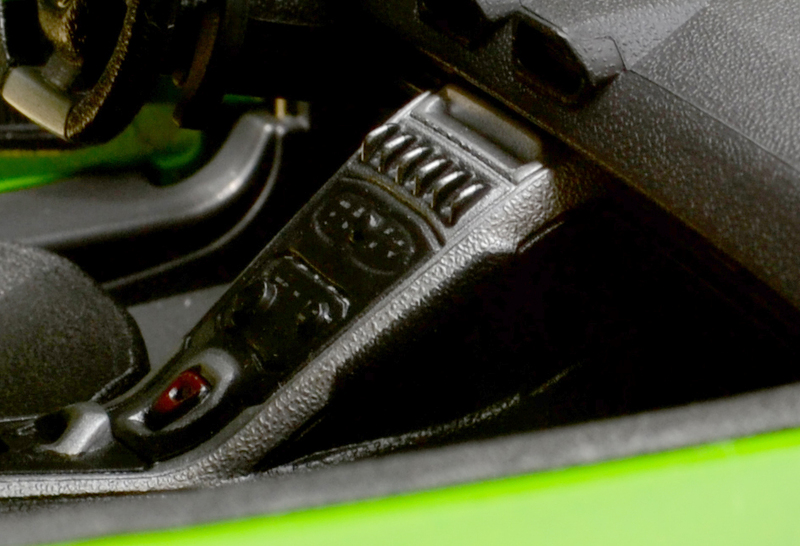 The super sized shift pedals is yet another bummer! Moved past the steering you would see those gorgeous center console with alot of buttons to play with. 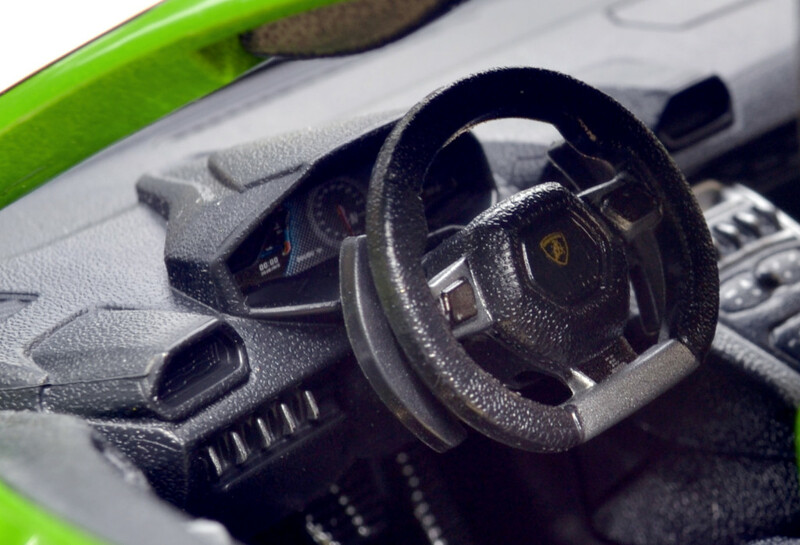 I especially like the super sized red start/stop button which is sort of off scale when compared to the real Lamborghini Huracan but come on its just a budget 1:18 diecast car from Bburago!!. 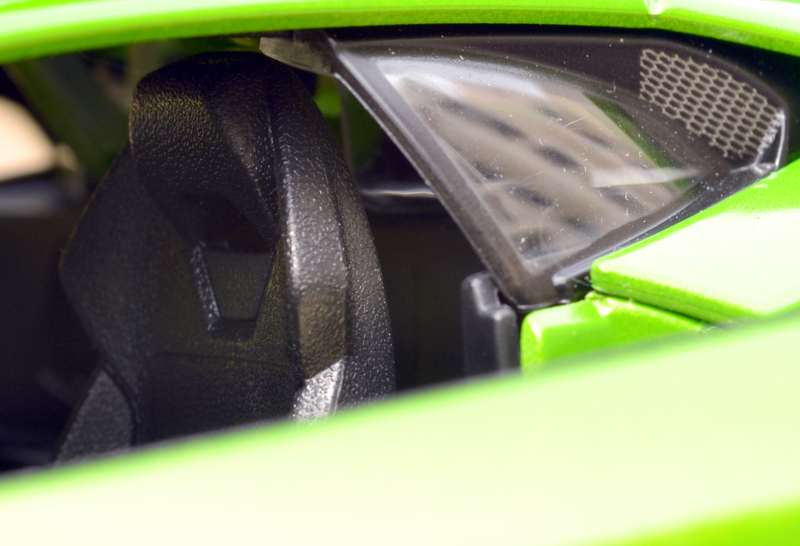 See a little closer then you also see the missing mirror controls in the doors that Bburago did quit well in their Aventador. 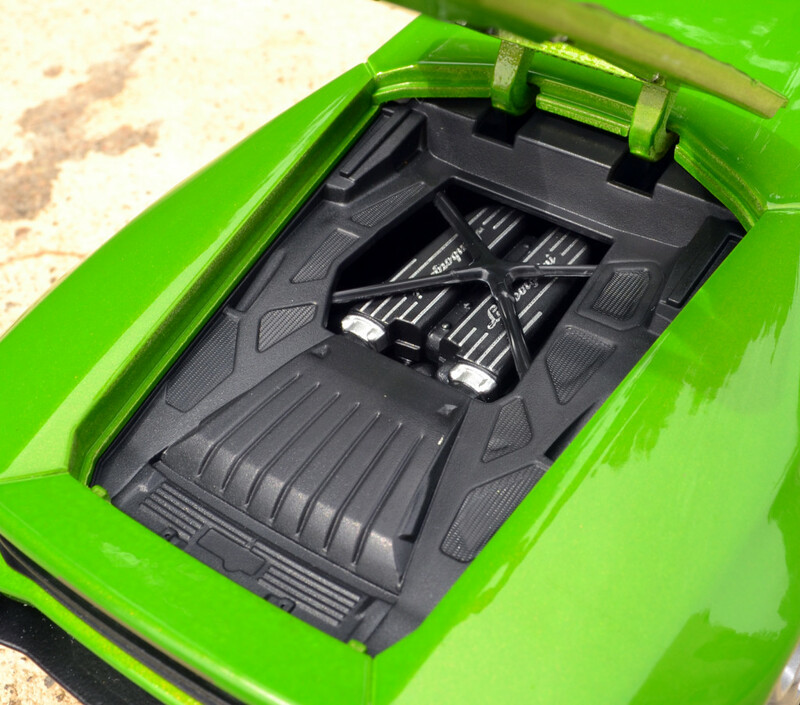 Engine & Engine Bay: Making an Italian mid engine super car comes with it own level of advantages… Those advantages are very well exploited by Bburago in this Lamborghini Huracan LP610-4, the engine is almost hidden and the only a sneak peak is shown through those transparent engine cover! 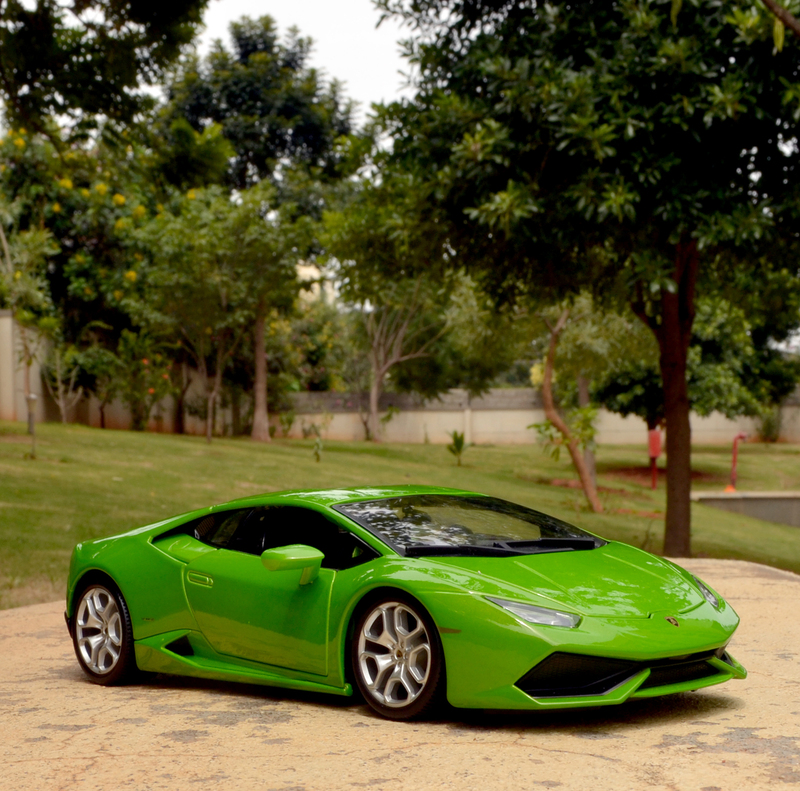 But what is possible within that boundary was not done by the Bburago in this green Italian!! 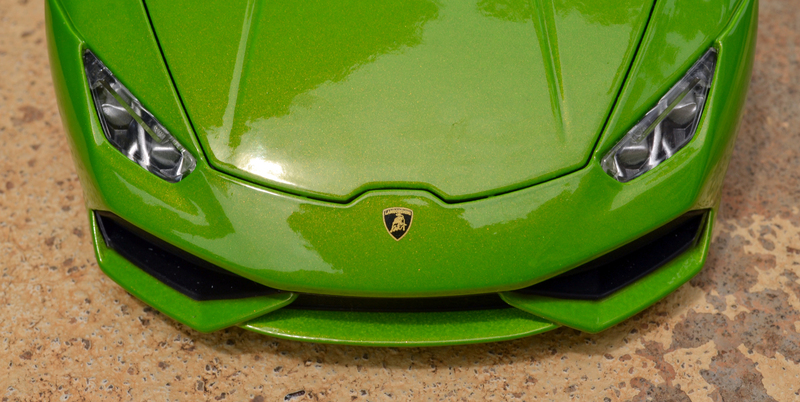 I like the way Welly had done on its Gallardo by adding materials to show that they mean details. 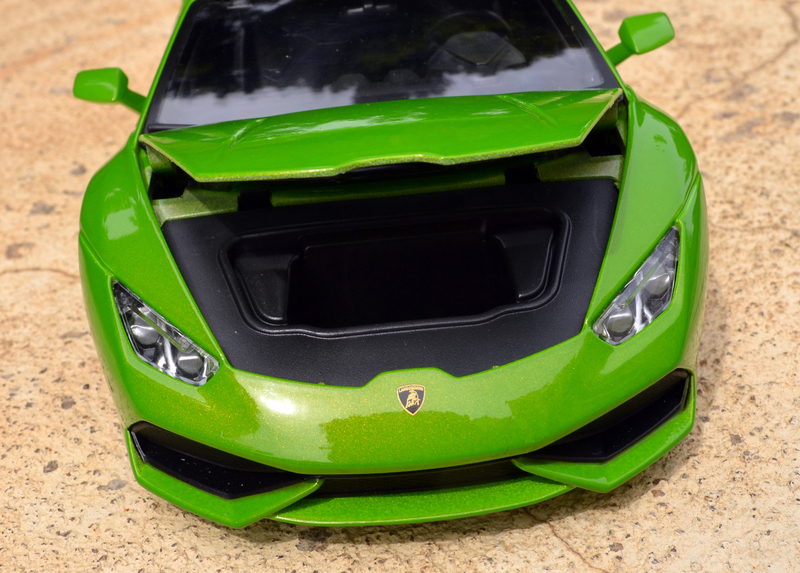 Verdict: There are more flaws to find in this diecast model starting from the interior scaling to some dodge decals… But I am still giving this Lamborghini Huracan LP610-4 a generous 4/5 for Bburago’s exceptional exterior execution and beautiful paint job! 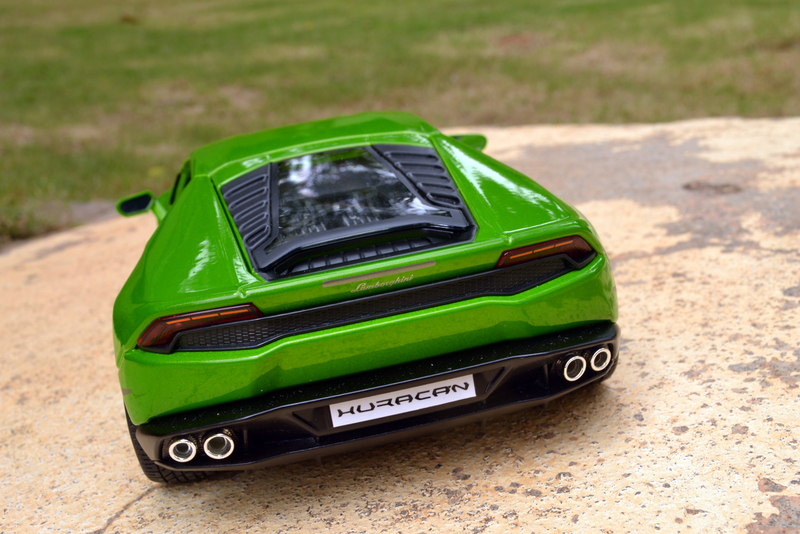 I actually wanted to give it a little more but one very reason why I dint do that is because Bburago dint do anything inovative here it can only be called as “just another Bburago” diecast car except the fact that it is a Lamborghini Huracan and is the first to hit the market in budget space. Ciao! !